Often the hardest look to create, the casual and relaxed look can be difficult. Torn between the joggers on the floor or your favourite frock, finding a happy medium can be extremely hard, especially if it’s an unexpected event! A casual look if often needed in a variety of occasions, as it is an outfit choice you want people to notice but an outfit that won’t stand out too much. Even though clothes are seen as the main component when creating a casual image, so is hair and make up. From wavy hair to subtle make up, the casual look can really be an outfit choice that accentuates you and your features. From a casual date to a family party, we will run though some of the pieces that you can combine to create the perfect causal look. These baggy trousers have burst back into the fashion world this summer. From Indian inspired patterns to the plain classic look,they can be perfect for relaxing at a friend’s house. 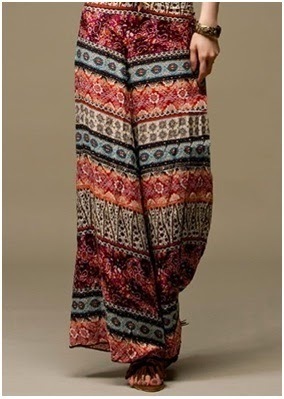 These trousers can be teamed with a plain tank top and loose jewellery. Make up can sometimes be the most difficult part of creating a casual look. Even though many say wearing hardly any make up is the best option, this isn’t always the case. If you team a light layer of foundation with your naturaleyes, this is a great place to start. Applying subtle brown and cream eye shadow can also make your eyes ‘pop’ but also look natural. Perfect for a first date, a t-shirtdress is a great way to make a first impression. If you match it with a pair of ankle high boots and some bangles, it can look flawless and be effortless. Relaxed shirts are the item to pair with some black smart trousers. These trousers can either be black skinny jeans or even cigarette pants. If you match these with a plain coloured tank top and then put an oversized shirt over it, it can create a relaxed yet professional image. The shirt can either be plan or patterned, whichever you think will suit the event more. When trying to create a casual, no effort look with your hair, it can sometimes be harder that creating a posh party look. The best way to achieve a relaxed look is too keep it natural but tidy at the same time, this can be achieved by using hair tongs to curl your hair. 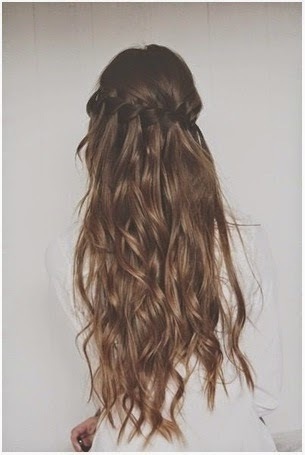 Even though these curls will appear quite tight and large when you first do them, just brush them through with a paddle brush and they will soon drop. Once you have done this, add a little bit of backcomb to your roots are your hair with look relaxed but flawless at the same time. There are plenty of shoes that you are able to wear when it comes to achieving a casual image. From boots to dolly shoes, it predominately depends on what your outfit is like. If you are wearing trousers, smart flats or coloured brogues can look great, as they are not too smart but aren’t scruffy either. If you are thinking of wearing a dress, teaming it with a pair of ankle boots can always look great. No matter what colour, they can either be flat or have a small heel, depending on the event that you are going to. Dressing casual doesn’t have to be as difficult as you may think. From relaxed open shirts to t-shirt dresses, there is something for everybody. The best thing to do would be to have a play around with your wardrobe and start matching items of clothing together that you may never have thought of before.